Did you know there are all kinds of teas you can use for your hair as a herbal rinse or spray, depending on the benefits you want to get and your hair needs? 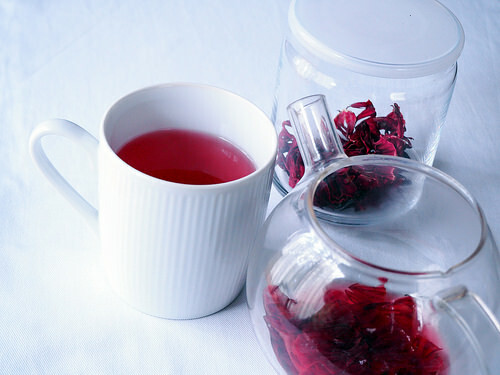 I of course have 2 favorites: hibiscus and green tea. Basically it is brewed tea that you either pour over your hair or spray onto your hair (once it is at room temperature). Some might choose to rinse the tea out later while others let it dry on their hair. I do both depending on which of the two teas I am using (rinse) hibiscus tea (leave on) green tea. *While teas are excellent for your hair, too much of a good thing can be bad therefore if this is new to your routine and hair I recommend rinsing out the tea. The information provided is for educational purposes only. I am not a doctor nor a medical professional therefore, please consult with your personal doctor or a medical professional before starting anything new and if you are pregnant always consult your personal doctor or medical professional. Black Tea – Reduces hair loss and shedding, adds sheen, naturally darkens the hair, provides softness and manageability. Calendula – Nourishes the scalp, helps elevate scalp irritations due to its anti-fungal properties and brightens blond hair. Chamomile – soothes an irritated/itchy/sore scalp, known to help with dandruff, provides sheen to the hair and relieves stress. It brightens blonde hair and brings out blonde highlights on light brown hair. Green Tea – Helps to combat hair loss, soothes the scalp, aids with scalp irritations, darkens the hair, provides the hair with strength and reduces breakage. Hibiscus – Provides shine, conditions the hair, has astringent qualities, reduces hair shedding and breakage and provides a deep red/purple tone which appears as an undertone in dark hair and is more visible in light/blond/bleached hair. Linden Flower – provides strength to weak hair, aids in hair growth, conditions dry & brittle hair and provides circulation to the scalp. Sage – invigorates and cleanses the hair and scalp, known to help reduces excessive hair shedding and hair loss. I will have two separate posts for my favorite tea rinses next! Do you use tea rinses/sprays for your hair? If so which are your favorite, I would love to hear from you! This entry was posted in Herbal tea rinse, Herbal tea spray, Tea rinse for hair, Tea Spray for hair and tagged Black tea for natural hair, Calendula for natural hair, Calendula hair rinse, Calendula hair spray, Chamomile for natural hair, Chamomile tea rinse, Chamomile tea spray, Green tea for natural hair, Green tea rinse, Green tea spray, Hibiscus tea for natural hair, Hibiscus tea rinse, Hibiscus Tea spray, Linden Flower for natural hair, Linden tea rinse, Linden tea spray, Moisturizing tea spray for hair, Natural hair tea spray, Sage for natural hair, Sage tea rinse, Strengthening Tea spray for natural hair, Tea rinse for hair, Tea spray for hair on December 14, 2014 by Maicurls. No it doesn’t matter that your hair is high porosity. Just make sure to a final rinse with cold water. As uncomfortable as it sounds, it will help lay down your hair cuticles. First off thank you for stopping by and commenting! I have never tried using peppermint tea (in truth I don’t know why since I LOVE peppermint). That combo sounds awesome, I will have to give it a try. Thanks again and thanks for the suggestion! Did a black tea rinse once. I left it in, but I was really uncomfortable. I just didn’t like the thought of having tea in my hair, lol. Maybe one of these days, I will try tea rinsing again. Ooooh, love this post!! I love tea rinses but do agree, you have to watch how you use. Personally I wash out, because that is enough for me when I do a rinse. My favorite is Black Tea & Green Tea. Hibiscus tea is great too, but was turning my hair a shade brown/red and I do love my black hair so choose to discontinue. Gotta try the others. Thanks a mil for this post my dear, excellent for us!!! Never thought of the spray so think I will start to do that to re-freshen my tresses.